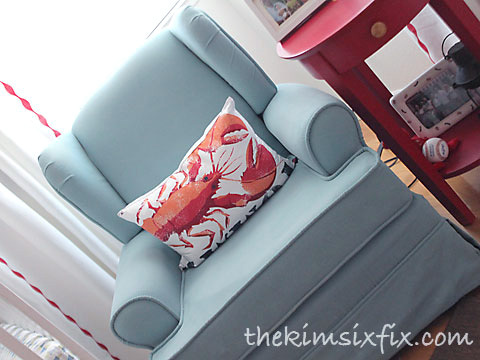 I finally am sharing my tutorial for painting upholstery that I used when I re-did the glider in the baby’s nursery. , spray on paint, Rit dye.. etc. 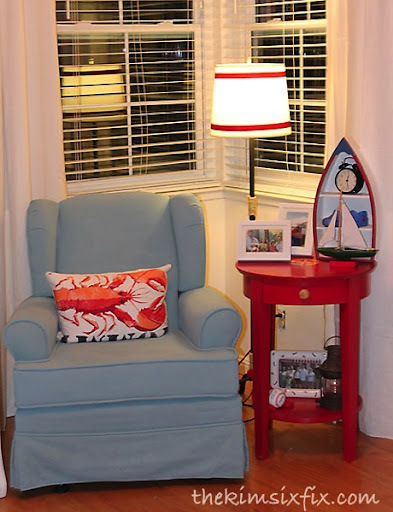 But this method (from Hyphen Interiors) is the one I most closely followed. 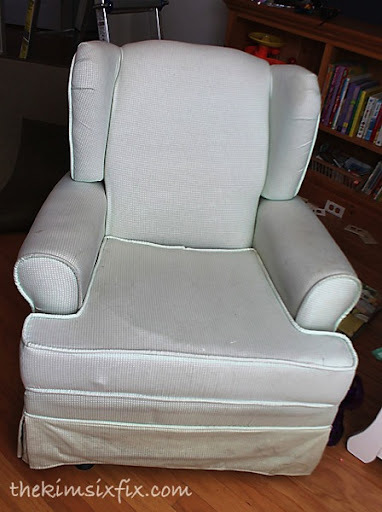 The reason I used latex paint and fabric medium is that the consensus is that it gives you the softest finish to the fabric. 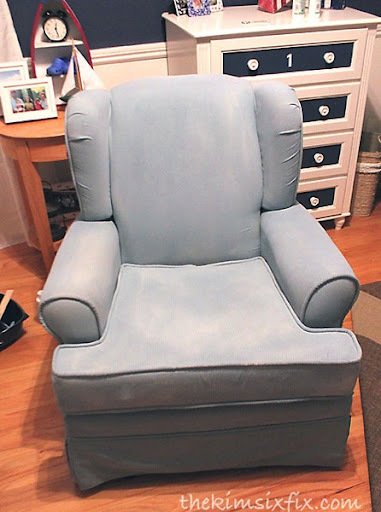 Other methods tend to leave you with a stiffer, more leather-like finish, and since this was a rocker that I was going to use with my baby, I wanted it as soft as I could get it. I was starting with a cotton gingham fabric, so I knew it would take paint really well and didn’t need to slather it on; diluted latex would be perfect. 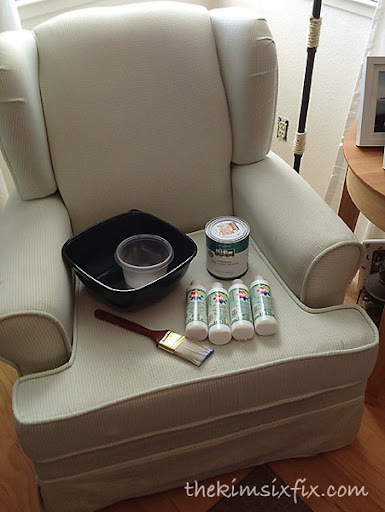 Here was what my chair looked like when I started. It was a minty green gingham I had used for both of my daughters. That is why it needed a makeover. 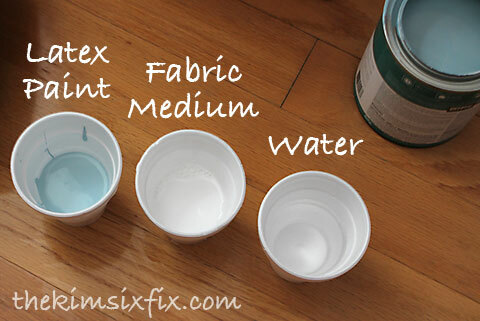 Use a ratio of 1 part paint : 1 part fabric medium : 2 parts water. I measured them in paper cups and mixed them in a large disposable salad bowl. 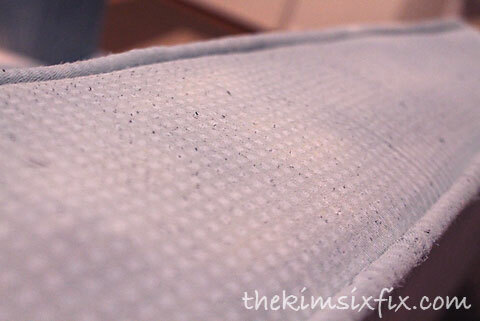 To apply the mixture you first want to pre-dampen the fabric with the spray bottle. It just needs to be damp since that helps when you bush on the paint. 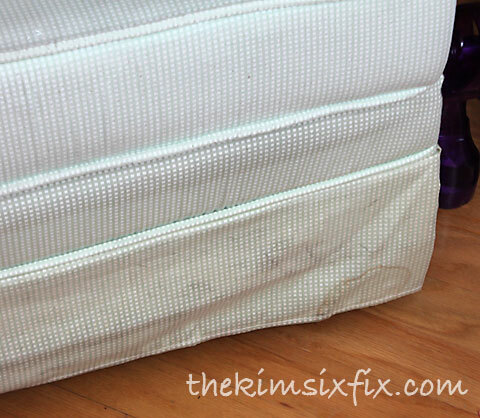 If you try to paint the diluted mixture on the fabric directly it will tend to run, and this process is messy enough without your paint dripping off the fabric. 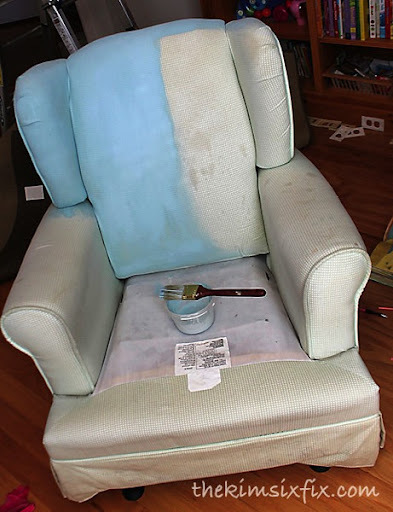 Here is what my chair looked like at the start of the process. 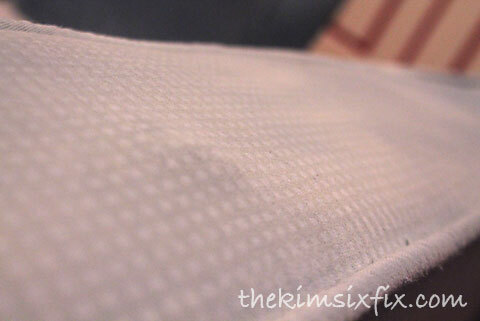 This was only one coat and so you can still see a little ’splotchiness’ and the pattern of the gingham showed through. I know most people only sand at the end of the process to soften the fabric, but I think sanding in between coats is a good idea. Not only did it knock down the pills, but it broke down the fibers and helped the second coat of paint stick. After sanding, I applied another coat using the exact same method. I only needed that second coat to completely hide the pattern and stains. 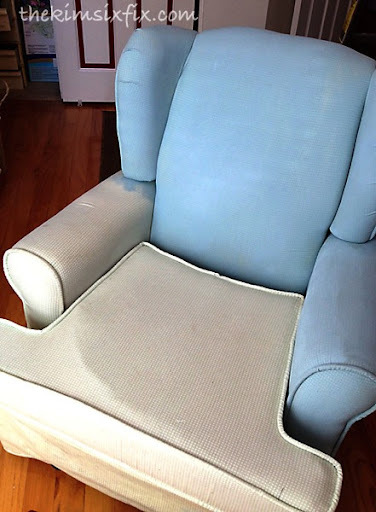 The number of coats you need depends on the color/pattern of the chair, the color of your paint, how thick you apply it etc, so your experience may require additional coats. I am really impressed with how great it turned out. 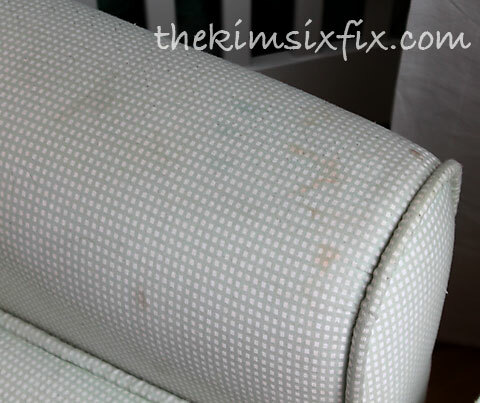 The entire makeover only cost $30 (for paint and textile medium). 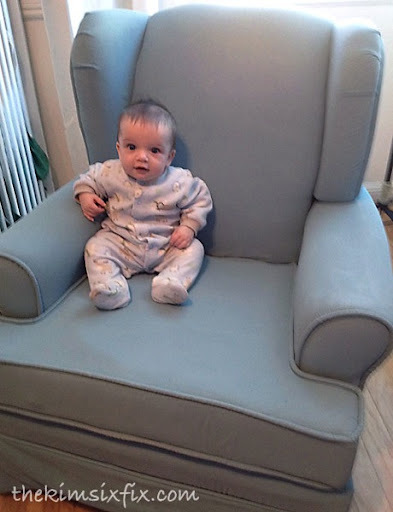 This chair wasn’t worth a much bigger investment than that. Even the baby likes it. DIY Database Blog at WordPress.com.